Saudi Arabia’s crown prince, speaking at a major investment conference, has promised his kingdom will return to “what we were before – a country of moderate Islam that is open to all religions and to the world”. Mohammad bin Salman bin Abdulaziz Al Saud made the announcement at the beginning of the landmark Future Investment Initiative in Riyadh on Tuesday. The country would also do more to tackle extremism, the prince said. “We will not waste 30 years of our lives dealing with extremist ideas; we will destroy them today,” he said when asked by Maria Bartiromo of Fox Business Network. “It was not like this in the past… We will end extremism very soon,” the prince added, in his most direct criticism of Saudi Arabia’s conservative religious establishment to date. Expanding on his earlier comments in an interview with the Guardian, the crown prince said that the country’s conservatism was in part fallout from Iran’s Islamic Revolution. Saudi Arabia, an absolute monarchy, is governed under an puritanical form of Sunni Islam known as Wahabism; it is extremist versions of Wahabism that are espoused by jihadist movements such as al-Qaeda and Isis. In the wake of 9/11, the Saudi authorities have worked alongside the US and other Western countries to tackle radicalisation and terrorism funding – but have often been criticised for not doing enough. The claims from Prince bin Salman will be met with scepticism internationally, as Saudi’s hardline clerics still wield much power and influence in the country. Rights groups continue to condemn the state’s human rights violations, the precedent for many of which is based on the Saudi interpretation of Quranic law. Prince bin Salman, who was suddenly appointed heir to the throne by his father King Salman bin Abdulaziz Al Saud earlier this year, is viewed by many as the face of the modern kingdom. The 32-year-old is the driving force behind ‘Vision 2030’: Saudi Arabia’s long-term economic and social policy designed to wean itself off dependence on oil, and is popular for his reforms to the country’s ineffective state bureaucracy. Last month, it was announced women in Saudi Arabia would be finally be given the right to drive, a symbolic move signalling changes to the institutionalised discrimination against women in the country. While Prince bin Salman has built his reputation as a bold and socially liberal reformer, critics note his hawkish foreign policy. As defence minister – a position he has held since 2015 – he has attracted censure over his role in Saudi Arabia’s bloody intervention in the Yemeni civil war, as well as his aggressive stance on Iran. The prince is also regarded as one of the primary decision makers behind the Gulf states’ recent cutting of ties with Qatar. Also at the Future Investment Initiative, Prince bin Salman announced the creation of Neom, a new $500bn (£381m) independent economic zone to be built on the border with Jordan and Egypt. The 2025 project will operate using alternative energy and serve as a worldwide technology innovation hub, he said. The conference, which runs until Thursday, is aimed at showing that Riyadh is opening itself up to the modern world and diversifying its revenue streams, following a global plunge in oil prices. Scientists disprove historical event described in the Bible. It is a command that led the leading atheist Richard Dawkins to claim that the God of the Old Testament was “a vindictive, bloodthirsty ethnic cleanser … a genocidal … megalomaniacal, sadomasochistic, capriciously malevolent bully”. A paper about the study in the American Journal of Human Genetics said that there had been “uncertainties” about the fate of the Canaanites. “The Bible reports the destruction of the Canaanite cities and the annihilation of its people; if true, the Canaanites could not have directly contributed genetically to present-day populations,” the researchers wrote. “However, no archaeological evidence has so far been found to support widespread destruction of Canaanite cities between the Bronze and Iron Ages: cities on the Levant coast such as Sidon and Tyre show continuity of occupation until the present day. The degree of genetic closeness between the ancient Canaanites and modern Lebanese people was something of a surprise as the area was repeatedly fought over and conquered by various different groups throughout history, although some of them did leave genetic traces that survive to this day. He added that it had been a “pleasant surprise” to be able to extract and analyse DNA from human remains that were nearly 4,000 years old, particularly as they were found in a hot environment. The Canaanites are roundly condemned in the Old Testament – they were the inhabitants of Sodom and Gomorrah, two cities destroyed with fire and brimstone directly by God, according to the Book of Genesis. While the Bible suggests they were wiped out by the Israelites under Joshua in the land of Canaan, later passages appear to contradict this and state that there were survivors. Some Biblical scholars have argued the passages describing the Canaanites wholesale destruction are hyperbole and inconclusive, and the genetic research would indeed appear to indicate the slaughter was much less extensive than described. Also known as the Phoenicians, the Canaanites proved to be great seafaring traders and established colonies across the Mediterranean. Austria becomes latest country to ban burqas. Austria on Sunday becomes the fifth European country to ban wearing full face veils such as the burqa and niqab in public, a move prompted by the recent wave of migrants from Muslim countries seeking asylum. 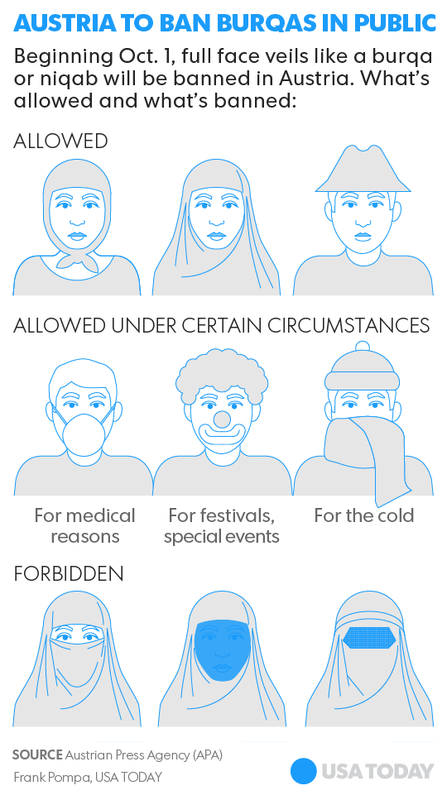 The prohibition will also apply to scarves, masks and clown paint that cover faces to avoid discriminating against Muslim dress. The Anti-Face-Veiling Act applies to anyone in public places and buildings, including schools, shopping malls and public transportation. Other measures aimed at refugees to promote integrating them into Austria include compulsory courses to learn German and the country’s values. Although there are no reliable numbers, the ban is likely to affect only a few hundred Muslim women in the country who now cover their faces. Also affected are some of the estimated 70,000 Arab tourists who visit Austria’s popular Zell Am See ski area every year. The new law has angered Muslim groups. The Islamic Religious Authority of Austria calls it an infringement on privacy, religious freedom and freedom of opinion. Austria’s burqa ban “is a clear discrimination of Muslim women, who once again become victims of a policy of coercion,” said Yeliz Dagdevir, 36, a Muslim psychologist in Lustenau who does not wear a veil. “Muslims are obviously still not a part of this country,” she added. People who obscure their face in public can be fined $175. Similar laws are in force or about to go into effect in Belgium, Bulgaria, France and Switzerland. Germany has a partial ban on face coverings that applies only when driving. Austria’s parliament approved the law in May after politicians, including Foreign Minister Sebastian Kurz — a front-runner to become chancellor in the Oct. 15 parliamentary election — argued that veils hinder Muslim women from integrating into Austria’s predominantly Catholic society. The burqa is “not a religious symbol but a symbol for a counter-society,” Kurz told Austrian broadcaster ORF in August. Austrian President Alexander Van der Bellen has criticized the law. “It is every woman’s right to always dress how she wants,” he recently told a group of students. Islam is the second most widely practiced religion in Austria, with 7% of its 9 million people practicing it. France has the largest Muslim population in Europe, estimated at about 6 million. “I am supporting the new law because women become invisible in public with full face veils,” said Erika Reisinger, 64, a commercial clerk in Krems. Rachid Nekkaz, French-Algerian businessman and political activist, has pledged to pay all fines imposed on women wearing full face veils in Austria. He has spent $350,000 covering similar fines in Belgium and France, Nekkaz told Austrian broadcaster Servus TV.